South Africa’s top ranked Wilco Nienaber and Ekurhuleni junior trio Jayden Schaper, Yurav Premlall and Casey Jarvis have signalled some serious intent for success on the upcoming South African Swing this February. Nienaber, whose breakout season in 2017 shot him to the number one spot of the Open Amateur Rankings, has kept pole position with consistent performances at home and abroad. He kicked off the 2019 season with a top five finish in the Free State Open and on Sunday he produced a masterclass of golf to lift the Gauteng North Open title in magnificent come-from-behind style. The Bloemfontein golfer found an extra gear after 45 holes, firing three eagles and 11 birdies over the last 27 holes to win by three shots on total of 16-under 200 at Silver Lakes Golf Club. With a large international contingent heading to South Africa and plenty of World Amateur Golf Ranking points on offer, it’s certainly the kind of form you want to take into the Africa Swing. The series kicks off with the African Amateur Stroke Play Championship at the magnificent Leopard Creekfrom 11-14 February, then travels to the Cape for the South African Amateur Championship at King David Mowbray Golf Club from 19-22 February and the SA Stroke Play Championship at De Zalze Golf Club at the end of the month. Nienaber might be heading to Leopard Creek on a wave of confidence at Leopard Creek, but fellow GolfRSA National Squad members Schaper, Premlall and Jarvis are also on the radar. Following Ekurhuleni’s successful title defence in the SA Under-19 Inter-Provincial at the end of last season, the trio has also made serious cases for success on the Africa Swing. Schaper ended a 12-month winning drought with victory in the Nomads North and South last August and won the second Nomads National Order of Merit (NNOoM) win in early January to cement his number one spot in the Junior Rankings. 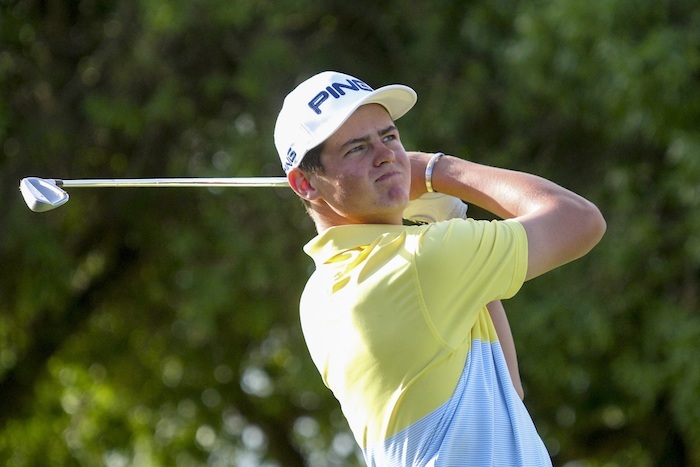 The Ebotse golfer also scored his second win on the Bridge Fund Managers Junior Series at ERPM and rose to sixth in the Open Amateur rankings with his season-opening win in the Free State Open. Premlall reeled in two junior titles and had his first provincial Open Amateur win late last year before becoming the youngest amateur to qualify for, and make the cut, in the SA Open Championship at Randpark Golf Club in December. The 15-year-old Glendower golfer stretched his purple patch into 2019, winning the first NNOoM at Umhlali Country Club. He lost to Schaper in the second NNOoM at Benoni Country Club, but beat Jarvis for his first Bridge Fund Managers Junior Series title at State Mines. Reigning Nomads SA Boys Under-15 and Under-17 champion Jarvis also celebrated his first provincial success on the Open Amateur circuit in the Ekurhuleni Open last year. Losing to Nienaber at Silver Lakes and Premlall at his home course has fired Jarvis up to gun for glory in the next four weeks. Nienaber and Schaper will also be lining up for GolfRSA in the Team Competition of the African Amateur Stroke Play Championship. Nienaber will lead fellow GolfRSA National Squad members Deon Germishuys, Therion Nel and Luca Filippi in the GolfRSA Senior side, who are still chasing a first win in the annual 36-hole team competition. Schaper, former SA Amateur winner Christo Lamprecht and reigning Junior Open champion Martin Vorster return for duty alongside with new cap Sam Simpson for the GolfRSA Juniors, who won the fourth edition at Glendower Golf Club last year. The two South African teams will face off against teams from England, France, Germany, India, Mauritius, Reunion, Scotland and Sweden over the first two rounds at Leopard Creek.